The Avid Editors of Facebook group page. Back in February, I wrote about some of my favorite LinkedIn Groups for the Film and Video Pros. 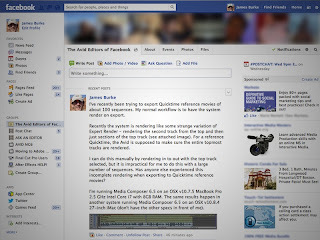 This week I have a list of my favorite resources on Facebook for digital video editors. These groups are great places to ask questions and get back answers from professionals from all over the world. The following list of Facebook pages or groups is in no particular order other than alphabetical order. After Effects HELP! - This is a group of Adobe After Effects users. This is a place to ask questions and/or show your knowledge of After Effects. This can also be a place to find work or look for freelance help. In addition, this group has a very cool cover shot. 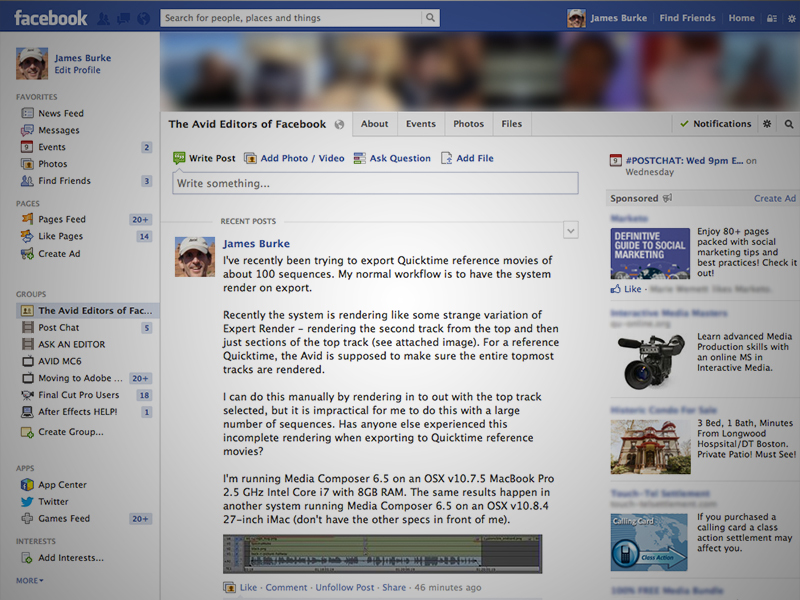 Avid Editors of Facebook - This is probably the largest Avid editing group on Facebook. This is a great place to share tips and tricks as well as learn more about using the Avid Media Composer system. If you run into a problem, this is also a great place to ask for help. It's also a great place to do some networking with professional in the field. Final Cut Pro Users - This is the largest group on Facebook dedicated to the discussion of Final Cut Pro Studio and Final Cut Pro X. Check out this group for the latest discussions on what's new in Final Cut Pro. Talk about tools, file formats, or even editing workflows, whether you're a new user, or been with FCP from the start. This is also a place to find FCP editors for your next project. Moving to Adobe Premiere Pro - This is a large group of Adobe Premiere Pro users. Share and discover tips and tricks as well as news about Adobe Premiere Pro. This group shares discoveries, resources, and work-arounds for new and seasoned Premiere Pro users. Post Chat - This is a group of editors who use all of the different NLEs that are available, whether it's Adobe Premiere Pro, Apple Final Cut Pro or Avid Media Composer. Topics range from video production and post production technology to discussions of favorite films. Postchat is also a weekly twitter-based chat, which utilizes the use of the hashtag #PostChat. The chat occurs at 6:00 PM PST (9:00 PM EST) every Wednesday. These online resources can be the best places to trouble-shoot a problem or learn a new digital editing technique. Hi Adam, sorry I overlooked that page, thanks for the reminder - it is one that I frequent.